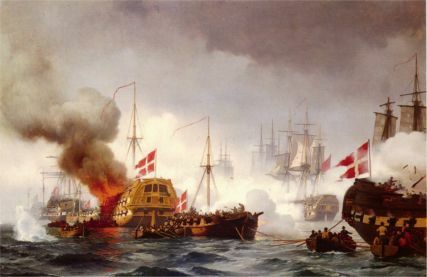 In this section you will find a chronological summary of the major events in the History of the Royal Danish and Norwegian Navy from 1801 and up till 1814, and the Royal Danish Navy since 1814 to the present day. Some major events, which took place before 1801, are also summarized into this time line; indicating they are still a major part of the past and present of the Danish Naval History. You wil also find a complete Royal Lineage covering the Danish Queens and Kings from ancient history to the present day. You will also find a complete survey of Sea Accidents and Losses, that have taken place since 1801. Accidents and losses caused by enemy actions are not included. Events marked with a indicates, that the day is also a Danish National or Military Flag Flying Day. Danske Søofficerer 1933-1982, edited by S. E. Pontoppidan og J. Teisen, Published by Søe-Lieutenant-Selskabet, Copenhagen, 1984.